I’m not one of the early pioneers. I started out in the computer world using Windows 95. I played a little in DOS but I can do nothing beyond what I have been explicitly told to do. My first personal machine was a Windows 98 computer, from right around that same year. It was hot. Pentium II 266 processor. 64MB (yes MB) of RAM. It seemed like over kill then. And a 4 GB hard drive. It was as much as I could afford, saving money by putting it together with a lot of help from a friend who know what he was doing. Today I spent a little time reminiscing about the old days of computing. I came in mid-stream of the computer revolution but it was still exciting times. I hadn’t spoke of these things for a very long time and Windows 95 was forever ago. 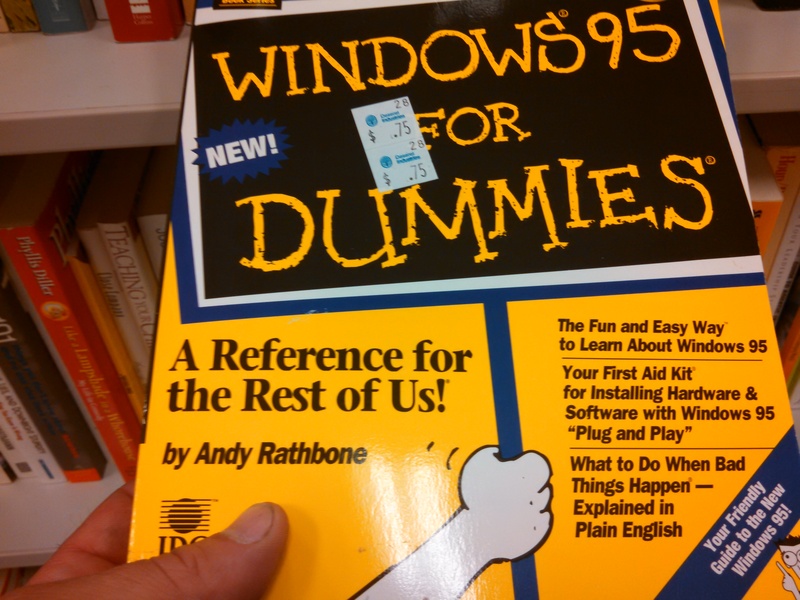 Yet walking through a second hand store, in the book section I found the ultimate throwback to those times: Windows 95 for Dummies. I confess, I could’ve used this book. When did you enter the computer world? Haven’t really, entered the iPad world instead! Built my blog my iPad and upload my posts and do a lot of my art on there as well. Good fun! Find computers a little clunky…but suppose I’ve just never used them much..have a great day…(though it’s night over here in Australia) all the best, Janette. It’s funny how some technologies are just skipped by some. You do incredible work on the iPad so I guess you didn’t need anything else. Thanks for the compliment! Yep, computers did skip by me..but when I found I could draw and paint on an iPad and do similar work to what I do on paper and canvas..(good fun!) it all sort of escalated from there! Also, with our four sons all grown up and doing their own thing, I have a little more time to play around with these new technologies. By the way, I’m really enjoying your posts. 🙂 All the best, Janette. CPM on a Dec Rainbow and DOS 1.1 on a 286 clone. Circa 1980. There was no Internet, but we all used Compuserve. That is some crazy stuff there. I hardly knew anything of a computer in 1980 but what I envisioned from movies and mostly Star Wars/Trek. We do still have a working 486 at work maintaining or light cycle program. It’s running DOS 6?